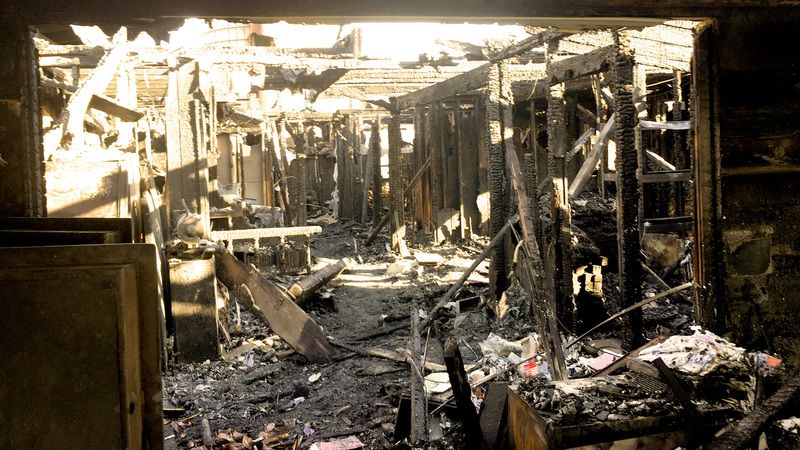 Fires are one of the most devastating things that can happen to our families and our homes. 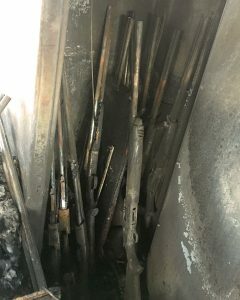 When the fire has died down and it’s time to sort through the ashes, what do you do with your fire-damaged firearms? We get a lot of emails and phone calls from people who’ve had guns go through a fire. 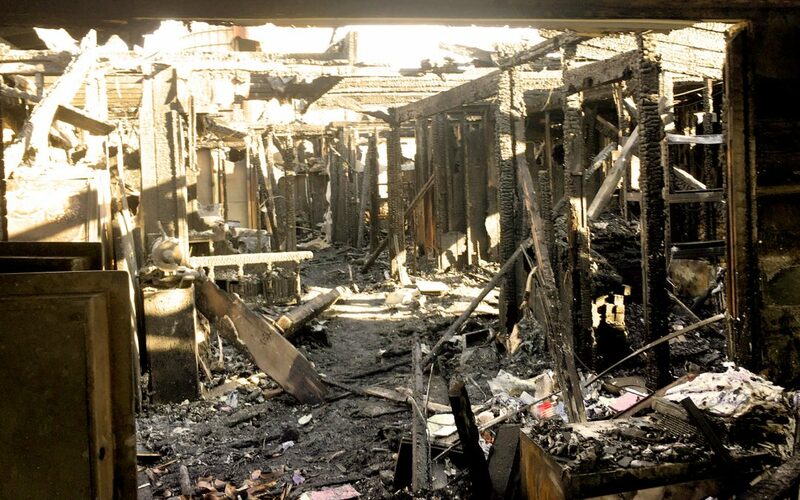 Questions like what to do immediately after a fire, if a firearm is safe to shoot, how much it would cost to restore, and how to deal with insurance. We asked Doug Turnbull to answer some of your most frequently asked questions. What’s the first thing you should do after your firearm’s been in a fire? As soon as you’re able, you need to get your firearms in a bath to get the soot and ash off and prevent rust damage. Either use a bathtub, or create one from 4 x 8 sheets of plywood and plastic sheeting. Then add ½ cup Tide detergent and 3 pounds baking soda to about 5 gallons of warm water. You can add more baking soda if you need it; you really can’t overdo it with the baking soda. Put the whole firearm in—including the wood and scope—and use a cloth to wipe the soot and particulate off. They don’t need to soak in the bath, just get a good wipe down to make sure all of the acid from the soot and smoke has been neutralized. Remove them from the bath and rinse. Then dry and oil your firearms. This process will keep the smoke and soot from rusting your firearm, as well as removing the smoke smell. A few years back a customer of ours had a big fire at his place. The fire was on a Wednesday night, and on Saturday we went down and started dealing with the firearms. He had hundreds in his collection. We created 4 x 8 plywood baths and threw 8 guns in at a time. We were able to save 90% of the firearms in his collection. If he had just oiled them and left them sitting on the back porch, they would have kept rusting and getting worse and worse. How do I know if my firearm is safe to shoot? Play it safe: After your firearms have been in a fire, bring them to a gun shop, or mail them to us to take a look at. You never know what sort of internal damage has taken place during the fire. We offer free quoting for restoration and repair work, and can disassemble, clean, and reassemble your firearm for a reasonable rate. Send us an email or give us a call to find out how much it would cost to clean your particular model. Can I tell if something’s “too far gone”, or do I need an expert to determine that for me? After cleaning if you’re unsure if it can be saved feel free to get in touch with us or your local gun shop for an expert opinion. We can often tell from photographs if it’ll be possible to save. When that’s insufficient we’ll ask you to send it in for free quoting so we can get a better look at it. It’s always best to get your firearms in a bath if you think there’s the possibility they could be saved. This revolver has been through a fire and left to rust and degrade. You can see examples of what Doug refers to as “scaliness” on the barrel. Normally this firearm would be too far gone to restore, but we were looking for a challenge! To fully restore this revolver we had to replace almost everything on it. While it makes a beautiful example, this sort of in-depth work isn’t something we take regularly take on. How much does it cost to restore a fire-damaged firearm? Restorations vary greatly depending on what sort of work needs to be done and what sort of firearm we’re dealing with. We recommend calling or emailing to find out what a “ballpark” guess is for your project. From there, we always recommend sending your firearm in for free quoting, assuming your firearm isn’t too far gone to be saved, a model we don’t work on, or something that would cost far more to restore than it’s worth. Whenever possible we offer suggestions for other gunsmiths who might be able to take on your project if it’s something we can’t help with. The slideshow below displays a fire-damaged Winchester 1894 Deluxe Takedown, after its “bath”, that is a firearm restoration candidate. How can I prevent losing my firearms in a fire? A fire-proof safe is always a good prevention step. Regular gun safes can heat up and act as an oven in a fire, but are still preferable to leaving your firearms unsecured. Another good option for higher value firearms and collections is insurance. One insurance company we’ve worked with in the past is Core-Vens Insurance. We offer insurance appraisals on your fire-damaged firearms for $150. Some customers have asked us whether they should get their firearms in a bath right away, or if they need to wait until the firearms have been appraised for their insurance claim. We asked Tim Hartsock at Core-Vens that question. “Your insurance company won’t penalize you for trying to preserve your property,” he told us. “It’s better to give it the chance to be saved than to gamble that it’ll still be salvageable in a few days or weeks after the soot has had a chance to eat away at it. Take some good pictures of the damaged firearms and do your best to preserve it.” At the end of the day, that’s an individual judgment call, but if it’s something that you’re attached to–or that you know has great value–we think you’re better off halting the corrosion from the soot and smoke with a bath. We hope that you and your family will never have to deal with a fire. But if you do, know that we’re here to help. From assessing the safety of the firearm, to insurance appraisals, all the way to full restorations, we’re here to make sure your firearm is one less casualty of your fire. Glad we could add something! And it’s always good to hear a firearm was saved to shoot another day. 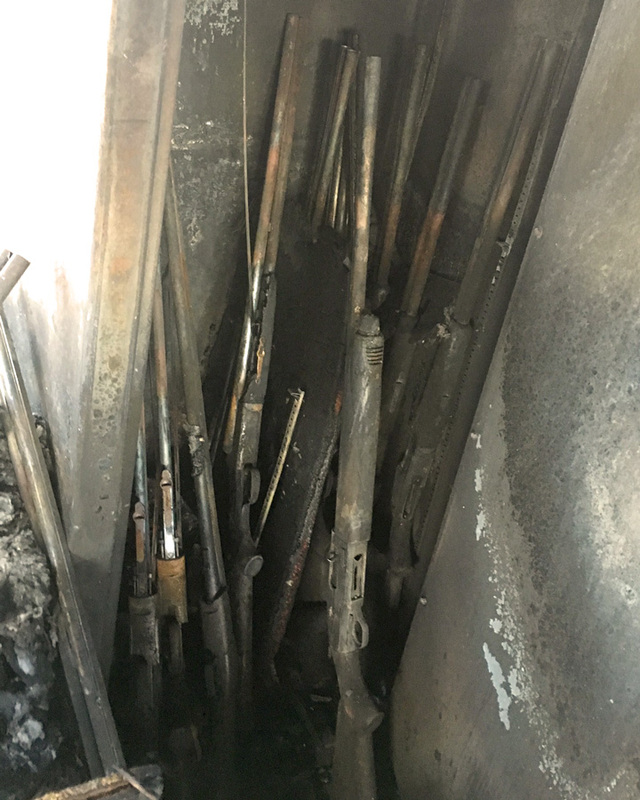 I work in a shop in calif and have recently gotten in a few firearms that have been I a fire and have seen the rust you are talking about …. I will try the bath solution TODAY … hopefully this will help …. thanks for the info !!!!! I’m so glad this post found you! Hopefully their firearms aren’t too far gone and you guys can save them at your shop. Good luck! Your restorations look far better than most new “high-class” firearms that I’ve seen! They are incredible “beauties!” I’ve got a rather “nice ?” old Parker VH E double that I would like to have restored, but I’ve had it for 58 years and now find myself 85 years old. and probably don’t have enough time left to fully enjoy the finished product! I am going to try and buy one of your beautiful showroom guns before I check out! Keep up the beautiful work Mr. Turnbull! 1911 handgun.Fire heat up to 1200. Gun in ammo can. Frozen. Feds would not let us go to property for a month. Sorry to hear about the fire. It sounds like your pistol really took some damage. Unfortunately I think you have yourself a wall hanger now. Although getting there sooner probably wouldn’t have saved your pistol, since it did heat up so much. You had you had to replace almost everything, would be nice to know what you replaced. Good question. As Doug recalls, we replaced the barrel, the cylinder, and the ejector housing. He’s pretty sure there were some other additional parts, but those are the major ones he remembers.